The unpastured woodland fit for hunting recorded in the Domesday Book of 1086 became known as the Forest of the Peak and was held by the Duchy of Lancaster. 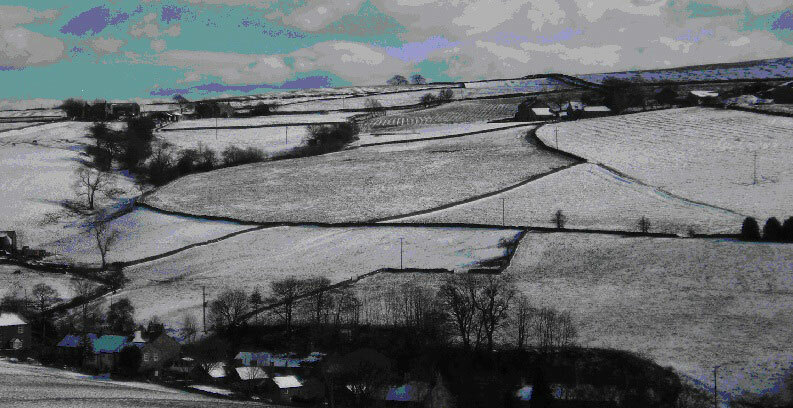 It was the gradual clearance and enclosure of this land for farming which has influenced the appearance of the landscape, with its pattern of fields and dry stone walls, which we see today. The Lords of Manors were the chief instigators of land improvement and during the 13th century in particular there was a period of economic growth and expansion, which resulted in a phase of woodland clearance, house building and land taking by assarting to create farmsteads. When the Lord of the Manor needed to create new farm for relative or valued retainer he would allow a ring fence to be laid out around a suitable piece of land on the common, surrounded by a ditch and bank with a hedge. An Assart such as this was cut or created out of land which had been set apart for hunting, not necessarily forested. Assarting could be carried out by the payment of a Fee, with permission, or payment of a Fine if done without. Either way it was encouraged, as the land was otherwise of no great value. 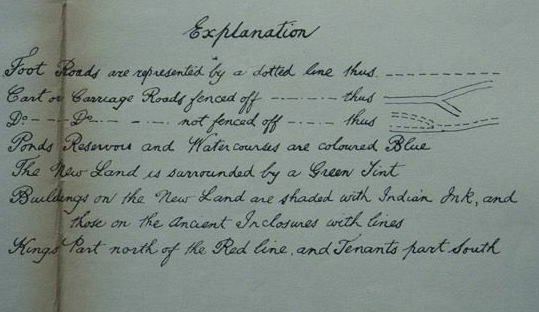 Initially the boundaries would be marked with a bank and hedge as dry stone walls were not constructed until later. The curving boundary of Birchenough probably dates from this 13th century process of Assarting, in this case carried out in a process of possibly four phases. Within this boundary small closes would be made for holding livestock and growing crops but much of the land would remain as wood pasture with scattered pollarded trees. People and animals moving across the commons would have to skirt the edges of any new boundaries, which is why present day lanes and paths sometimes define perimeters of these ancient settlements. The Dark Peak soils, being heavier and wetter are more suited to pastoral farming than arable. Even so, it would have been difficult to make a living from a scattered farmstead without the availability of Common Land. Maintenance of productivity depended on moving livestock off farmland and onto commons during the growing season. Farmhouses were situated near the edges of their enclosed land not in the centres, reflecting the crucial importance of intercommoning to the farming economy in early times. Then, only after the corn and hay were harvested was the livestock gathered off the moors and returned to the fields, where arable crops benefitted over the winter from the animal manure. Hardy flocks of sheep were bred which could survive on the coarse vegetation. Intercommoning flocks were not confined by boundaries but moved around through the summer season. The wool from these flocks was the raw material of domestic textile industry. Some of the higher, steeper and wetter parts of the commons however defied improvement, such as parts of Cobden Edge and Ludworth Moor, which remain little changed. There were no fields or boundaries except for those along the moorland edges and these were more likely to be hedgerows rather than walls. The principle ways onto the Commons were long strips of common land projecting called Horns, which were frequently gated, making it easier to gather the livestock off the commons. The horn leading into Moorend had a Pinfold where animals found to be in the wrong flock could be left to be collected by the rightful owner. Some farms with land adjoining the commons had their own gates onto the moors. These horns gave access to travelers crossing the moors, tracks worn by generations of people walking or riding to market, to worship or to visit their neighbours and packhorse trains crossing the Pennines. 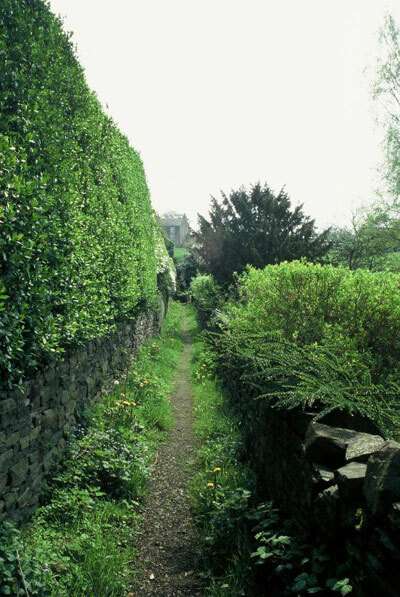 Several other footpaths and bridleways skirted the boundaries of enclosed land on the unenclosed side. Shepherds and travelers would be helped by landmarks as the routes would only have been defined by walls and hedges when the land on either side became enclosed. Holloways, which are deep channels made by generations of wear, arean indication of longstanding existence. The process of enclosure was accelerated tremendously however by Charles the First, who, finding himself short of funds and with Civil War approaching, decided to enclose and sell off parts of the Commons which the small farmers depended upon for summer grazing. 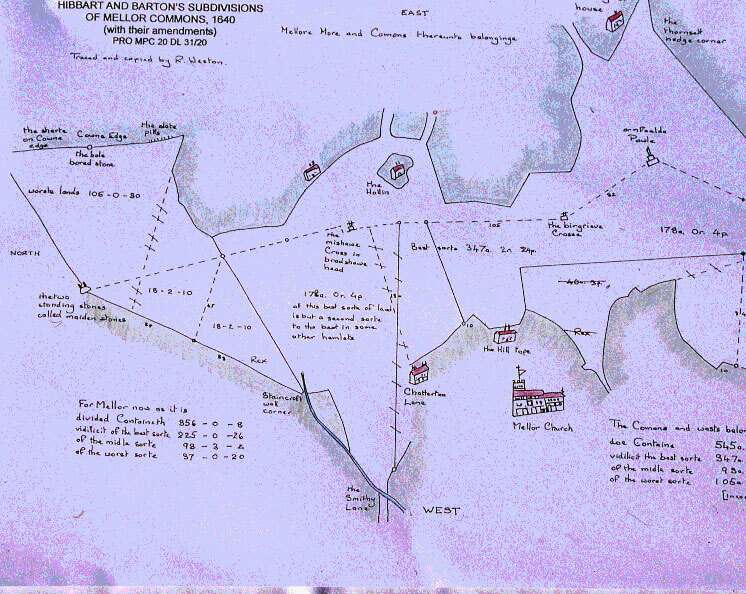 He appointed two surveyors, Hibbert and Barton were employed to carry out a pioneering survey of Mellor Commons in 1640. The task was a colossal undertaking to survey 14,664 acres. They were instructed to classify land into best, middle and worst sorts and to divide this equally between the King and the Tenants and remarkably the plans for this have survived. This subdivision was too complicated, however, so their solution was to draw a median line between three landmarks; The Maiden Stones (Robin Hoods Picking Rods), and the now missing Mishawe and Briergreve Crosses, intending to divide the common more or less equally between Thornsett and Mellor. 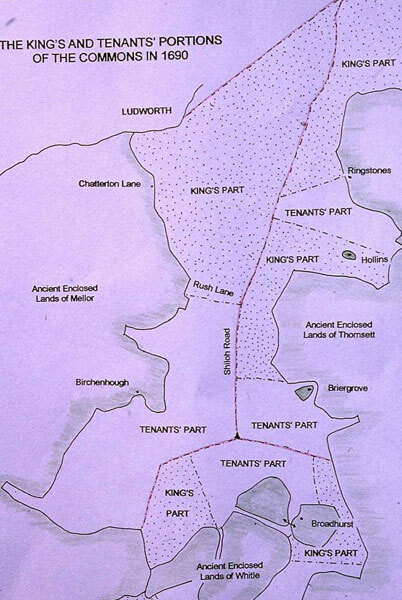 In Mellor the commons north of Rush Lane went to the King and an equal area remained with the tenants and freeholders. Civil War intervened however and this was not enacted until after restoration of the monarchy to Charles the Second. This threatened the practice of intercommoning which the small farmsteads depended upon to survive. It must have come as no surprise therefore that a huge dispute broke out in 1675, when the Crowns share of 7,300 Forest Acres went to Thomas Eyre of Winster, for the small annual sum of �100.00. In his turn, he tried to lease or sell the Kings part in various lots. 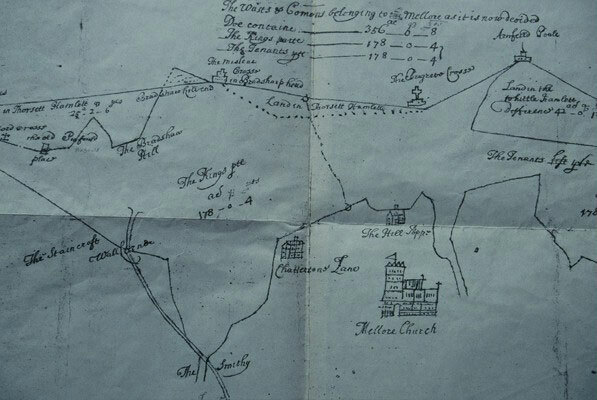 Such a lot of resistance to this sale of commons land that dispute dragged on for decades, so that it was not finally sold off and divided into new farms until the early decades of the 17th century. 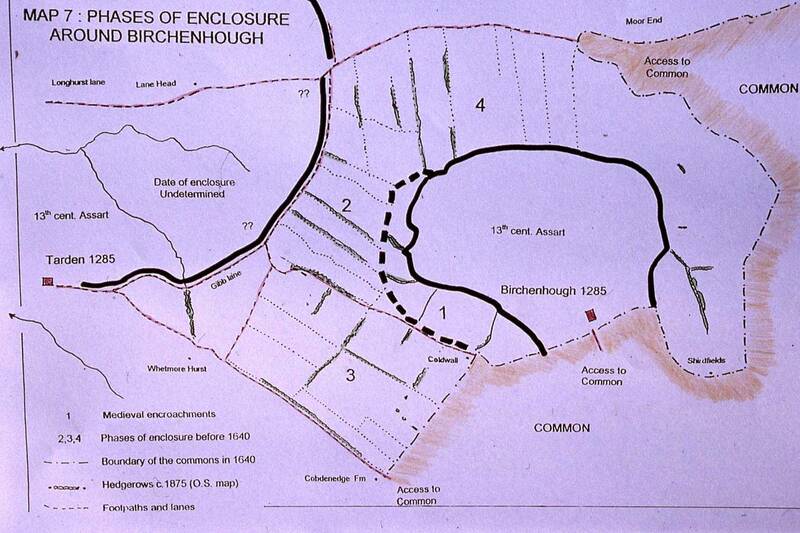 The newly created Shiloh Road was then laid out for access, following the Mellor and Thornsett boundary. Portions of the hedge bank which formed the boundary can still be seen on some western portions of Shiloh Road. 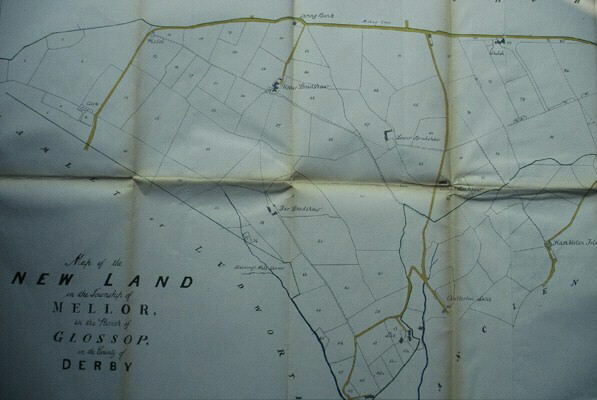 A key to the earlier maps lay in one commissioned by the Jowett family in 1844, drawn as many maps were, to evade taxes or prove rights to tithes. Fortunately this map interpreted the 1640 and 1690 maps so precisely that it is possible to identify features in the landscape and the division between Kings and Tenants land with greater accuracy.